Kassa Overall photo by Michael Craft. 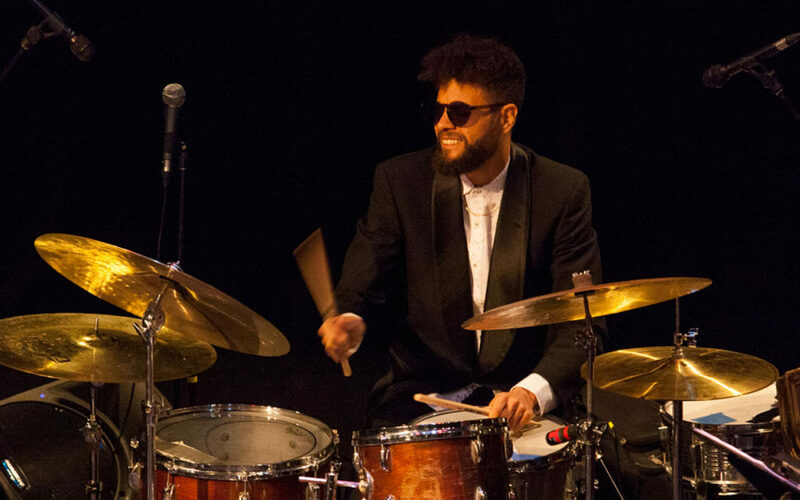 Over the course of January 4–12, Lower Manhattan hosted the 15th-annual Winter Jazzfest. The idea of a January migration from the freeze of Seattle to the even gustier New York City did not sound appealing, initially. Still, thousands of people like myself flocked from all over to keep warm with the sounds and sensations of a deeply extensive jazz bill. Just scratching the surface, artists included: Gary Bartz, Kahil El’Zabar, Meshell Ndgeocello, Mary Halvorson, Georgia Ann Muldrew, The Bad Plus, Terence Blanchard, Nubya Garcia, Ben Wendel, James Poyser, Chris Dave, Allison Miller, and Marquis Hill. An impressive bulk of Seattle-reared artists filled out the list: Kassa Overall, Evan Flory-Barnes, Roxy Coss, The Westerlies, Aaron Parks, Delvon Lamarr Organ Trio, and Miles Okazaki. A staple of New York’s epic Jazzfest is the multiple-night “marathon” that can certainly feel like a scramble: twelve venues, more than 100 acts falling somewhere on the spectrum of jazz, overlapping sets from 6pm to last call, and cripplingly brisk walks between locations in and around Greenwich Village. This year, the festival expanded its billing to cover three marathon nights between two weekends. The first Saturday of the run, Seattle bred, NY-based brass band The Westerlies presented their hypnotizing collaborative project with Theo Bleckmann, “Songs of Resistance and Refuge,” highlighting protest movements past and present. The project had its Seattle premiere this past September during the inaugural 4-day Westerlies Fest. Around the corner was The Bitter End, New York’s oldest rock venue with standing room only, squeezing the audience like sardines to either side of the stage. This night, the Delvon Lamarr Organ Trio with their funky tones, packed the red-bricked room to capacity, while a line grew outside. A standout of the festival was the great strides it took to address Gender Equity in jazz. This year, Winter Jazzfest announced a goal to make festival bookings fifty percent gender-equitable by 2022. Between the packed weekends, Winter Jazzfest hosted concerts and public talks centered on this initiative, including a discussion on “Jazz and Gender,” which saw Seattle native Roxy Coss on the panel, fresh off of leading her quintet at Zinc Bar the previous night. What also works well in diversifying this festival is the inclusion of various stages curated by niche labels and specialty groups like the French Quarter, Revive Music, and a Chicago collective with International Anthem recording artists, including Makaya McCraven. Several artists were particularly impressive in their crossover between styles and multiple bands, often in the same night. This can be said of a busy handful, and particularly of Seattle’s multi-faceted artist Kassa Overall (drums, electronics, spoken word). Overall seemed to be flitting gig-to-gig, including a spot at Le Poisson Rouge with Seattle’s Aaron Parks (piano) in a promising set by Terri Lyne Carrington’s newest project, Social Science. Overall lead two of his own shows this festival, both with long-time Seattle collaborator Evan Flory-Barnes on bass. During a grooving late-night set with Flory-Barnes, Kassa called Seattle-raised flutist Anne Drummond to join the stage for a fresh take on an Erik Satie composition. Before they began, Overall cracked a joke into his microphone, and reminisced on a moment from Garfield High School band with Flory-Bares and Drummond, now a New York mainstay. If Kassa’s personable performances leave you any question of his hunger for the music, we should also tell you that Overall released his newest digital project Go Get Ice Cream and Listen to Jazz, the same Friday of Winter Jazzfest. Winter Jazzfest coincided with both the annual APAP (Association of Performing Arts Professionals) conference and the jazz industry forum, Jazz Congress. Panel sessions carved out space for Northwest voices. Discussions included “Presenting on the West Coast,” “Alternative Jazz” (with Aaron Parks), and “Making Space in Jazz for Transgender Voices” (with The Westerlies’ Riley Mulherkar and Chloe Rowlands). Several West Coasters, including Thomas Marriott (trumpet), made the voyage to pay their respects to the late-and-great Roy Hargrove who was honored in an epic 5-hour celebration of life that took place at Jazz at Lincoln Center. A who’s who of Seattle-rooted artists popped up over the week in the big Apple: Gregg Belisle-Chi (guitar), Carmen Rothwell (bass), Luke Bergman (bass), Ivan Arteaga (saxophone & clarinet & flute), Haley Freedlund (trombone, voice), Evan Woodle (drums), Mike Gebhart (drums, piano), Chris Icasiano (drums), Neil Welch (saxophone & electronics), and beloved Cornish-grad, NY-mainstay Briggan Krauss (saxophone, guitar). Some of us came to be a part of it for only the weekend; some don’t plan to fly west again for some time.